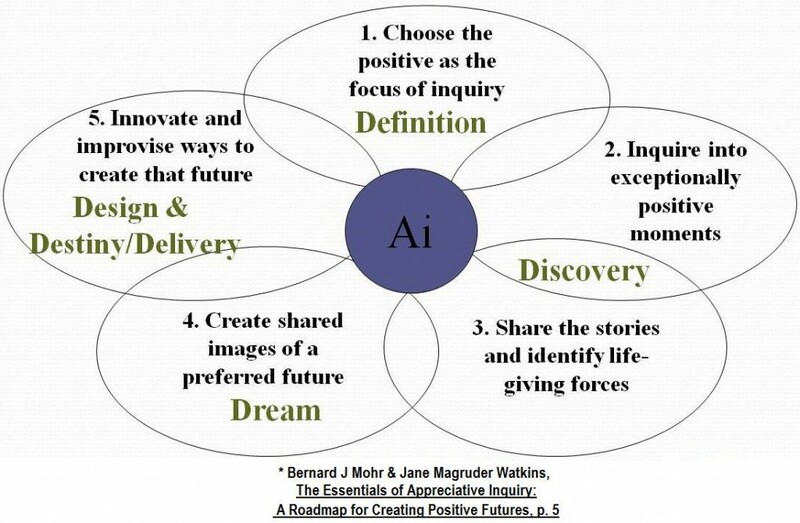 Below is a graphic illustrating the five core processes of Appreciative Inquiry; often referred to as the 5-D’s. It is important to define the overall focus of the inquiry (what the entity wants more of). Due to our traditional, deficit-based problem-solving mind sets, it is sometimes easier for us to first identify an important gap, issue, or problem (what we want less of) instead of reframing it into what we want more of. In Appreciative Inquiry we use interviews as the way to evoke stories that illuminate an individual, team, or organization’s strengths. When are we functioning at our best? What characteristics are present? Positive stories – unlike data, graphs, lists, etc. – stir imaginations and generate excitement about the individual, team, or organization and what it is capable of accomplishing in the future. This way we build on what is already working. When developing positive questions that explore the topic, it is important to be mindful of the language used. The language of these questions will determine the direction the inquiry will take (negative or positive), and the results of the inquiry (negative or positive). Just asking the questions begins to bring about a change in any human system, so be careful what you ask for. The goal in this stage is not to choose the best stories, or even those that represent the norm, rather the purpose is to find what elements are common to the moments of greatest success and fulfillment. In this stage ask yourself, ‘what are the most promising and inspiring components of a desired future? Just imagine if all those exceptional moments became the norm in the future! Life Giving Forces (LGFs) are elements or experiences within the organization’s past and/or present that represent the organization’s strengths when it is operating at its very best. A life-giving force could be a single moment in time, such as a particular customer transaction, or it could be large in scope. It can be any aspect that contributes to the organization’s highest points and most values experiences or characteristics. Continuing with the energy in stage 3, this step asks individuals to create a future in which the high points identified in the stores are the everyday reality. The individual, team, or organization will literally design the structure – whether it is resources, business processes, policies, whatever – for achieving this desired future. “…the ability to express a vision in metaphors….is an essential quality of leadership” (Capra, 2002). Visioning or dreaming process consists of a visual image and word image. Visual images can consist of drawing, songs, skits, collages, dances, etc. Word images result from visual images. In other words, you are translating the visual image into a word image, called a Provocative Proposition (sometimes referred to as a Possibility Statement, Shared Vision, or Dream Statement). A provocative proposition bridges the best of ‘what is’ with your/their own speculation or intuition of ‘what might be’. It is provocative to the extent that it stretches the realm of the status quo, challenges common assumptions or routines, and helps suggest real possibilities that represent desired possibilities for the individual, group, or organization. This step puts the flesh on the skeleton that is coming to life. Individuals, team and/or organizational members innovate and improvise ways to create the preferred future by continuously improvising and building Ai competencies into the culture. It also includes noticing and celebrating successes that are moving the system toward the preferred future the organization or group co-created. For some organizations, this might mean a new way of communicating with customers (internal or external) or perhaps develop a new management training program – the possibilities are endless. Capra, F., The Hidden Connections: Integrating the Biological, Cognitive, and Social Dimensions of Life into a Science of Sustainability, New York: Doubleday, 2002. Mohr, B. J. & J. M. Watkins, The Essentials of Appreciative Inquiry: A Roadmap for Creating Positive Futures, Waltham, MA: Pegasus Communications, Inc., 2002.